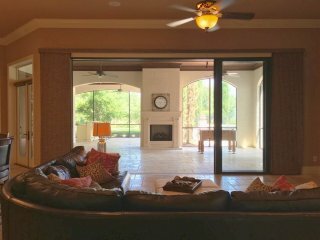 NEW PRICE - WORTH LOOKING AT! 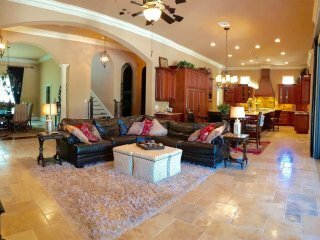 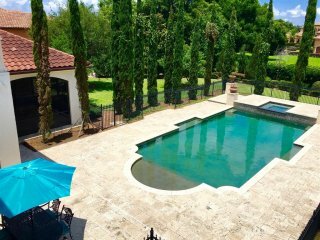 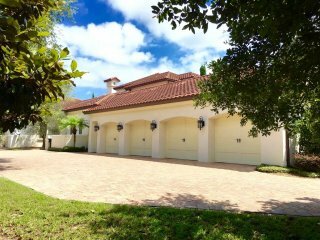 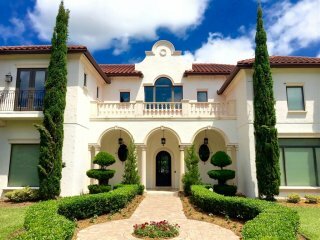 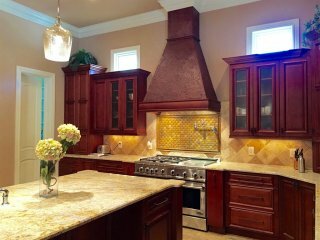 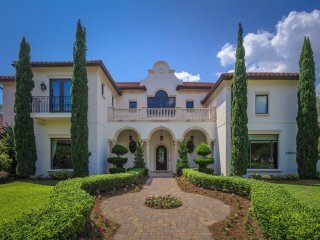 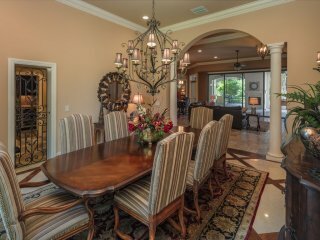 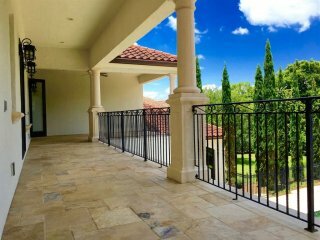 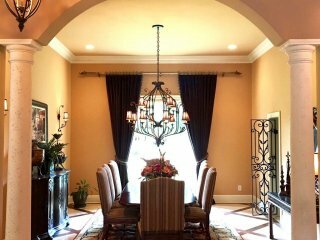 STUNNING Mediterranean estate home is located in a gated community on a prominent corner lot. 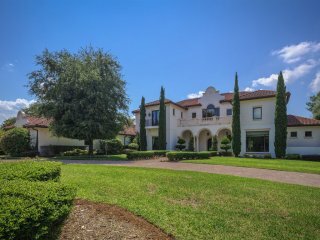 One approaches the home from a wide, sweeping circular drive where the home is set back from the street and is embraced by a mature formal landscape with sprawling grounds. 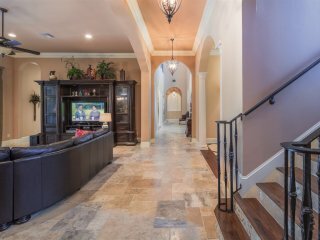 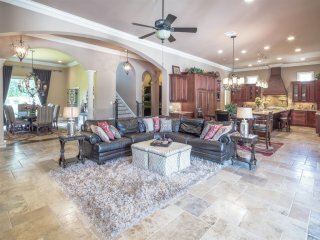 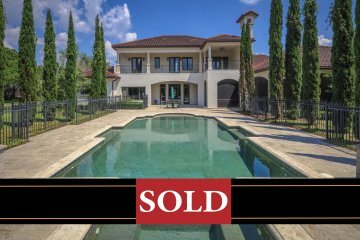 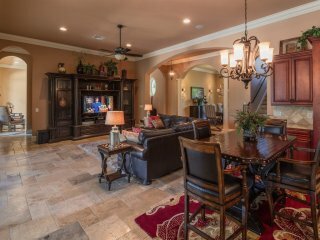 The home exhibits fine craftsmanship with high ceilings in an open floor plan, where large rooms with stone floors seamlessly flow into each other in beautiful voluminous living spaces under high ceilings. 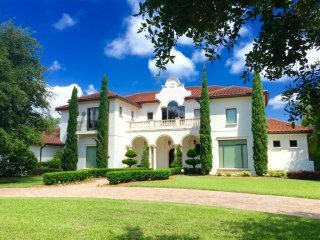 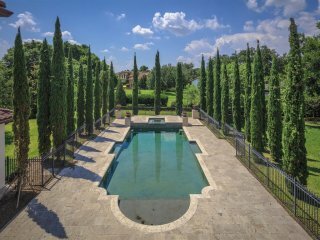 A charming Cathedral entry door greets you and opens to a wide two-story hall which spans the width of the home, and leads you to a formal living room with over-sized picture widow which frames the stately, formal Cypress trees standing guard around the salt-water swimming pool. 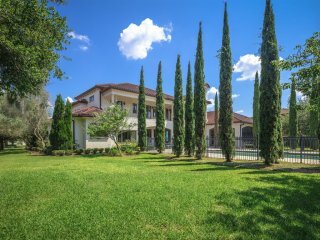 The sprawling grounds with mature landscaping are impressive and rare in today's market. 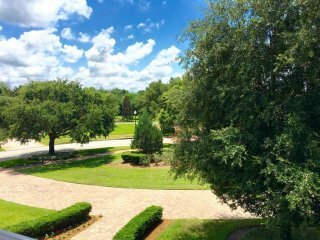 if you are tired of large homes on small lots - you will really enjoy this lot and its setting - which is perfect for children to play, or large outdoor gatherings, or just more privacy! 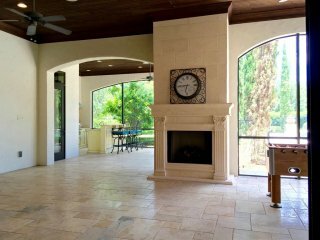 Some of the features include the following: formal living room, dining room with wine cellar and butler's pantry, 2 wet bars (in Dining Area and Family room area), master bedroom suite with an adjoining lounge area set in a bay window overlooking the rear setting, an over-sized marble master bath, privately-located guest suite with full bath, large game/media room. 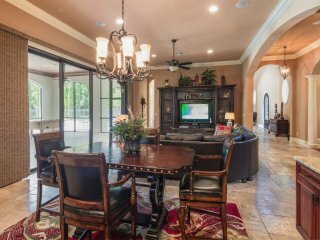 Your family will also enjoy an over-sized eat-in Kitchen with stone flooring which opens directly to a large Family Room where you will find sliding/stacking wall-doors that open wide to a 38' screened outdoor entertainment area-complete with fireplace and Summer kitchen. 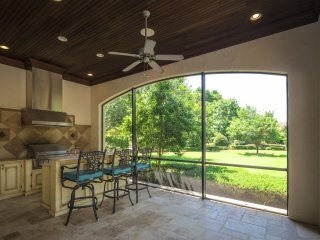 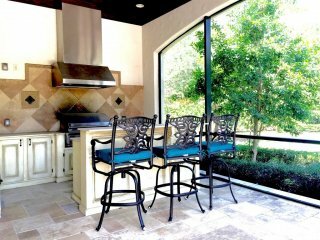 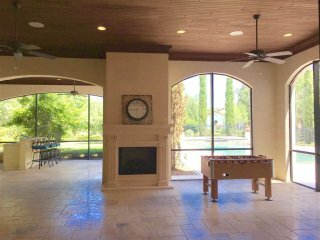 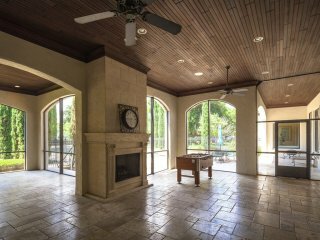 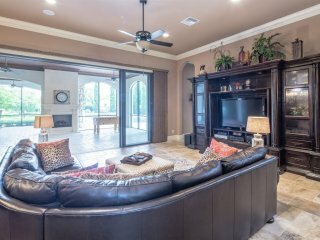 The screen doors open to the back yard and pool area - this is definitely not your average screened porch! 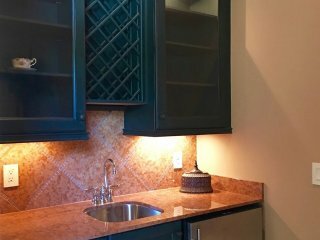 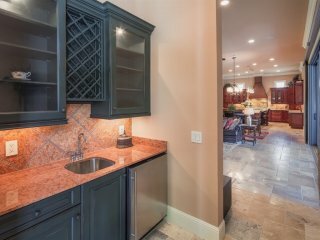 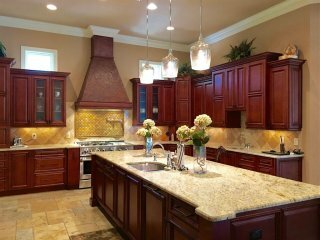 The kitchen is over-sized and offers high-quality appliances, beautiful custom wood cabinets, 10' walk-in Pantry, granite counters and a 10' long granite-topped food-prep island with sink and room for pull-up bar stools for snacking - or watching the chef! 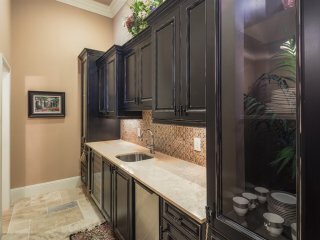 (Women will love this!) 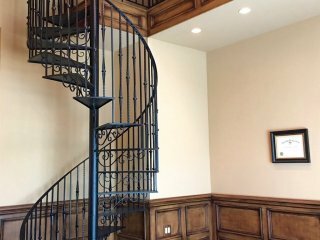 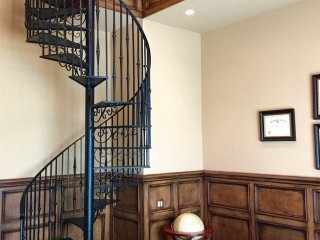 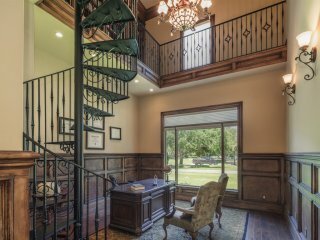 A lovely two-story home office boasts a spiral staircase with circular staircase leading to the Library above. 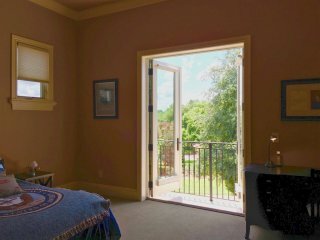 The Master Suite and Guest Suite are located on the first floor (perfect for older visiting guests). 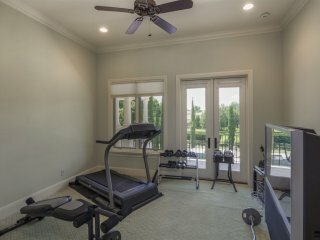 The second floor offers 3 bedroom suites each with full bath, and an exercise room. 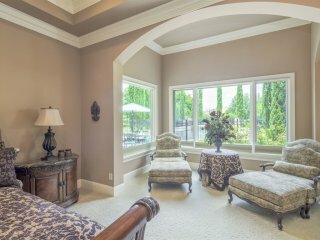 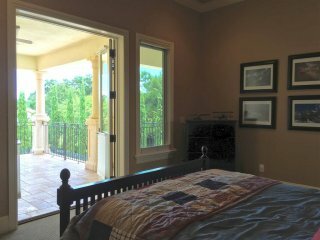 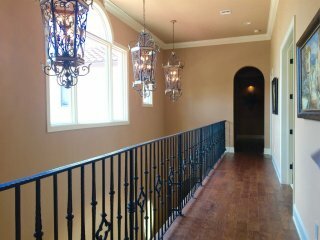 All upstairs rooms open to private balconies and offer beautiful views of the grounds. 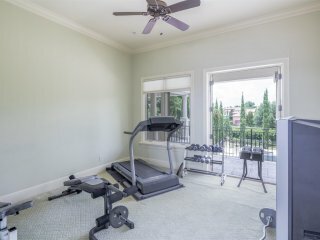 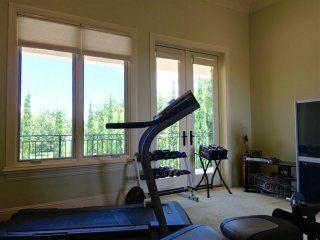 The exercise room could be used as a 6th bedroom or playroom for small children. 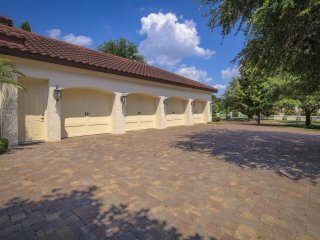 To complete the picture, there is a 4-car side-entry garage. 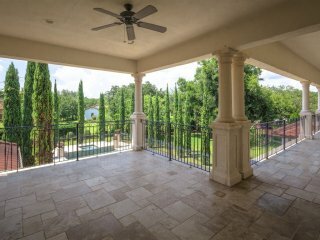 The lot is impressive and the house is stunning! 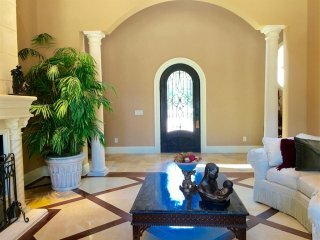 The Mediterranean architecture is timeless. 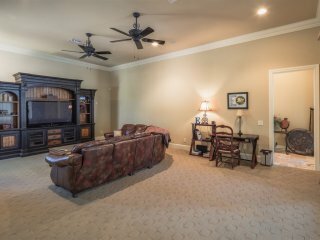 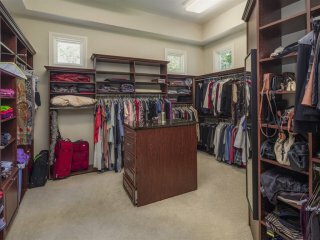 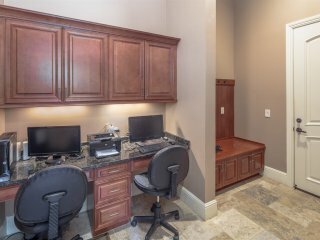 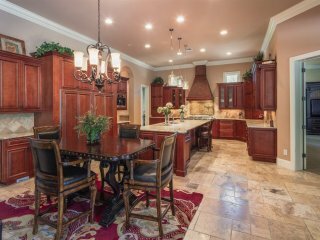 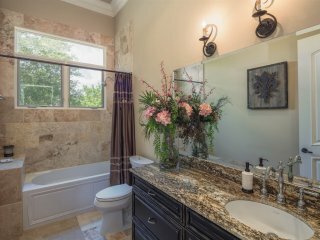 Be sure to click on the Virtual Tour !